Skid systems consist of a roller conveyor and a workpiece carrier for receiving transported products. Skid conveyor systems are often used in the automotive industry, where engines, transmissions and body parts must be transported. Skid systems are mainly operated by roller conveyors. Our resilient skid systems ensure a smooth, reliable service and are relatively low-maintenance. Other possible conveying elements for skid transport are chain conveyors and slat conveyors. For discharging processes, the skid conveyor can be equipped with an eccentric lifting table to ensure excavation even at high load. Eccentric lifting tables are low maintenance and can cope with high clock cycles. If greater heights need to be reached, hydraulic scissors lifts can be used. Power is transmitted via a toothed belt or duplex chain from roller to roller. By using timing belts as drive elements, the skid conveyer is largely maintenance-free and quite. The feed roller is modular and, thanks to modern bearing inserts, low-wearing and the time consuming processes of adjusting the drive belt is not necessary. The push-skid conveyor is a pushing unit comprised of working platforms arranged alongside each other. Push-skids are continuously in operation. 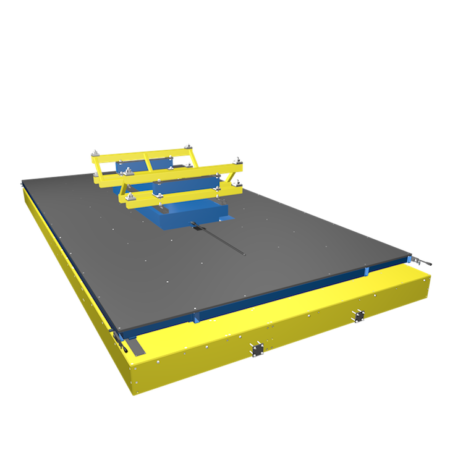 The push-skid itself is a mounting platform on which the operator and the vehicle body are located. Push-skids usually consist of a steel base frame which is then clad with a wear-resistant, shock-resistant, water-repellent and antistatic wood flooring or compact layer of laminate. The platforms are mechanically coupled to each other so no gap nor height differences occur in the pushing unit. The platforms are moved by drive motors at the beginning of the assembly line. Push-skids can be equipped with rollers or guide rails, which are installed on the floor. The lateral guidance of the push-skids is implemented with adjustable roller guides and the push platforms can be supplied with power inductively or via current collector. The push-skid can be equipped with a lifting table which sets the necessary mounting height of the vehicle on each working cycle.